Zita the Spacegirl by Ben Hatke came to our libraries last spring. I did not get the chance to read it when it first came in but she captured my attention on the shelf yesterday so I sat down right then and there to read it. She is so fun! Zita and her friend Joseph are playing outside when they discover a large crater. At the bottom of the crater is a thing with a red button. What do you do when you see a button? You push it of course! Joseph and Zita both end up in another world. Joseph is kidnapped and it is Zita's job to find him. She begins looking but no one will help her. Eventually she starts meeting some very interesting characters. She brings them along on her journey and before you know it, she has a team of characters all looking for Joseph. They have to battle the bad guys to get through and make some surprising discoveries along the way. 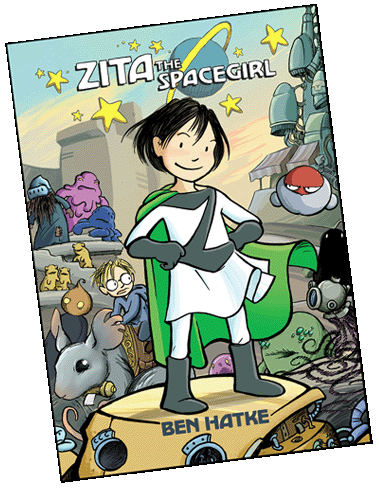 Zita is a graphic novel that moves along quickly and has awesome illustrations. You can check this book out at any of our libraries (741.5 HAT) and you can check out her website HERE. One of our newest books in the library is Squish: super amoeba by Jennifer L. Holm and Matthew Holm. (They are brother and sister.) The Holms are the same authors who wrote the Babymouse series. I know a lot of students love the Babymouse books! This book is about a blob named Squish, who is an amoeba. He has two best friends, Pod and Peggy. Peggy is always happy and talks to anyone. When she starts to talk to the class bully, Lynwood, she doesn't realize he is about to eat her! Squish must do something! Will he be able to stand up to Lynwood and do what's right? Read this awesome graphic novel to find out! 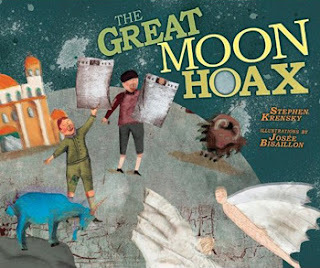 Today I read a book called The Great Moon Hoax. It is written by Stephen Krensky and illustrated by Josee Bisaillon. This book is about two boys who sell a newspaper called the New York Sun. The boys line up every morning to purchase 100 copies of the newspaper. If they are lucky, they will sell all of the copies by night time. This book is a wonderful way to learn about how newspapers were sold in the 1800s and the stories they would print. Could you sell a newspaper standing on a corner shouting out the headlines? A really fun book was sent to me over the summer. 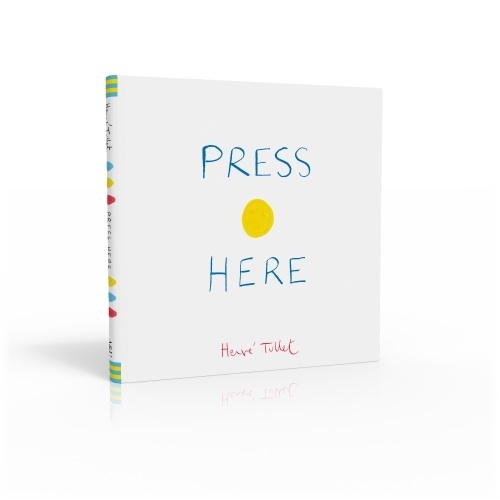 It is called Press Here by Herve Tullet. 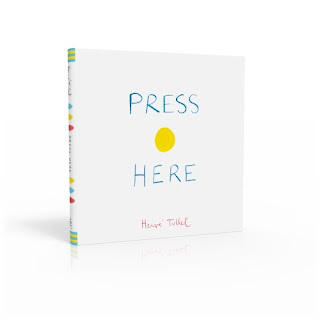 A yellow dot is the star of this book. On the first page, you are told to press the dot. On the second page, now there are two yellow dots! Press again and there are three yellow dots! How about shaking the book? Oh my! Now there are dots everywhere! This book is really a fun one that will make you giggle as you complete the action and then turn the page to see what happened. WOW! I read the Hunger Games trilogy by Suzanne Collins a few weeks ago. I was amazed! 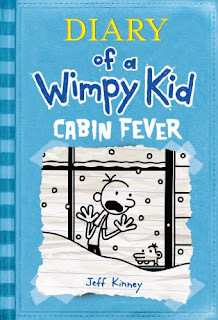 These books were awesome! In the first book, The Hunger Games, we meet Katniss and Peeta. Katniss lives in a future version of our country. 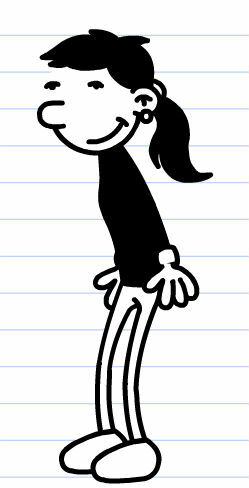 She is selected as one of the kids that has to go to the Hunger Games. 24 kids are chosen to go to battle every year and they fight until only one person is left alive. Peeta is the boy that is chosen from her town. She knows him, but not very well. In an interview before the Games, he says he loves her! Katniss doesn't know what to think but the Games are starting and she has to go fight. Doesn't this book sound crazy? I cannot imagine this happening! As soon as I finished the first book, I went to the library to get the second one. When I finished the second one, I just about ran to the library to get the third one! They are so very good in my opinion. Have you read them? What do you think? I would recommend this book for the end of the year for some of my fourth grade readers. We do not have any of the Hunger Games books in our elementary libraries but they are available at the public library and the middle school library. 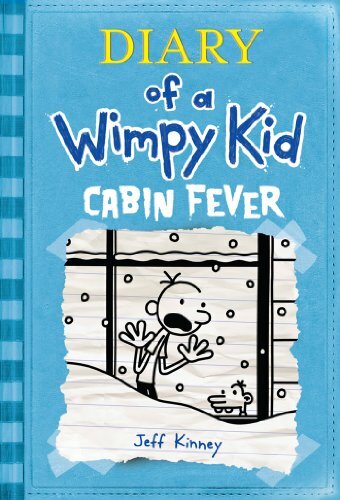 Maybe this is a book to keep in mind for when you move up to the middle school. I just loved it so much that I had to add it to my blog! Welcome to the 2011-12 school year! Welcome to a new school year everyone! I hope your summer was super fun and you are ready to learn this year! 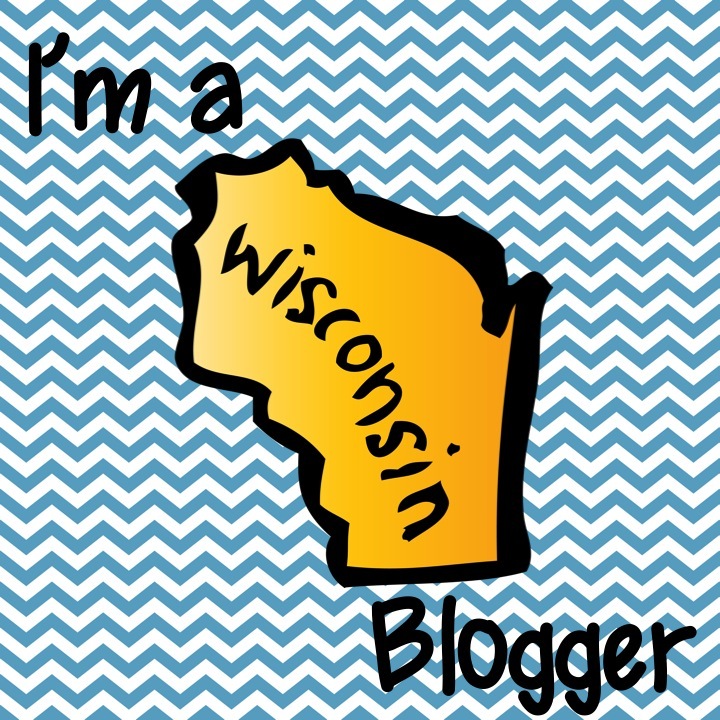 We will be having some fun things happening on the blog, including some comment contests every once in awhile! If you leave a comment on one of the book reviews I do, you will be entered to win a prize. More details about that will come later. Kindergarten can check out 1 book. First through third graders can check out 2 books. Fourth graders can check out 3 books. 1. Be quiet enough to hear the directions. 2. Only touch your own computer.